Novamind is an interactive visual mind mapping software for Windows and Mac OS X. It lets you begin with a central concept and allows you to add more elements as your idea blooms. After a while, you get a full overview of your concept that you can present to others with confidence. Novamind, unlike other mind mapping tools, has a straightforward enterprise pricing. A single subscription plan gives you access to all tools and functionalities of the application. However, you can also opt for a basic, though robust, version of the app with limited capabilities. This makes the solution a cost-effective option. 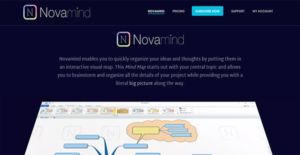 Novamind is a feature-rich mind mapping application. It is the culmination of more than a decade of research and development. As such, you have all the tools you may require to create a mind map that reflects your thoughts and suits your needs. You can use Novamind as your brainstorming companion. The application lets you capture ideas rapidly and automatically lays out topic shapes into a compact mind map. Because of that, you can focus more on the fleshing out of ideas rather than on arranging things on your workspace. With Novamind, you can reorganize your thoughts on screen with a click and a drag. This function lets you adjust your topics or collapse them temporarily as your map expands. The application then automatically rearranges your elements accordingly to save you time. Novamind comes with a set of themes that you can customize to suggest professionalism, playfulness, and other characteristics. You can even create your own themes that reflect your moods and preferences so you can make the application your own. Instead of exporting your ideas to other presentation tools, you can show other people your concepts within Novamind. The application has a one-click presentation mode that does not require additional preparation processes. As such, you can spend more time on developing your thoughts rather than worrying about your presentation. If you are considering Novamind it may also be sensible to check out other subcategories of Best Mind Mapping Software listed in our base of SaaS software reviews. There are well-liked and widely used solutions in each software category. But are they necessarily the best fit for your company’s special wants? A popular software solution may have thousands of customers, but does it provide what you need? For this reason, do not blindly shell out for popular systems. Read at least a few Novamind reviews and mull over the aspects that you desire in the software such as the fees, main functionality, available integrations etc. Then, choose a few systems that fit your requirements. Check out the free trials of these apps, read online comments, get explanations from the maker, and do your investigation systematically. This exhaustive homework is sure to aid you find the finest software solution for your firm’s special requirements. How Much Does Novamind Cost? Novamind has a straightforward enterprise pricing. One price gives you access to all features and functionalities. We realize that when you make a decision to buy Mind Mapping Software it’s important not only to see how experts evaluate it in their reviews, but also to find out if the real people and companies that buy it are actually satisfied with the product. That’s why we’ve created our behavior-based Customer Satisfaction Algorithm™ that gathers customer reviews, comments and Novamind reviews across a wide range of social media sites. The data is then presented in an easy to digest form showing how many people had positive and negative experience with Novamind. With that information at hand you should be equipped to make an informed buying decision that you won’t regret. What are Novamind pricing details? What integrations are available for Novamind? If you need more information about Novamind or you simply have a question let us know what you need and we’ll forward your request directly to the vendor.